To begin making the stripes cut four red and four white 1” x 11” strips. Sew them together, always putting the white on top (so it won’t warp). This will make you sew each one in the opposite direction. When complete, trim to 4.5” x 10.5”. 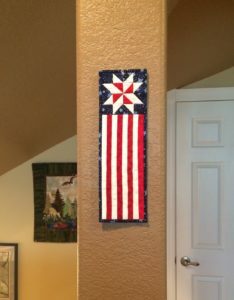 To make the star you will need 4 red and white 1.5” (unfinished) Half Square (HS) triangle blocks. You will also need 8 blue and white 1.5” HS triangles blocks and 4 blue 1.5” squares. You can make the HS triangle blocks by any method you like – I prefer Thangles or Triangulations, or some kind of paper piecing – but if you don’t want that you can start with a 2.5” square of each color. Draw a diagonal line on the back of one square. Sew them together ¼” from the line on each side. Cut in two, press open and trim to 1.5”. Next you can lay them out like the photo to the left and sew them into rows and then sew the rows together. 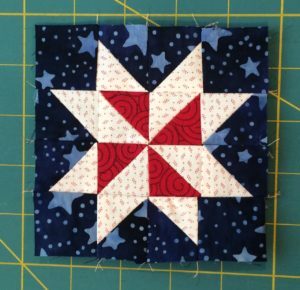 Now sew the star onto the end of the red/white stripe block. Quilt as desired. Bind in red or blue, label the back and enjoy hanging it for the 4th of July. Here’s a link to download a pdf of the pattern if you’d like! The last photo is showing you where I hung it in my house. It fits great on a column or it would also look good if you have a narrow space between two windows. I enjoy hanging red/white/blue quilts around the house in July to celebrate our nation’s birthday and because I love Patriotic quilts. ← Follow Along with Phyllis – Last meet-up – Quilts Revealed!